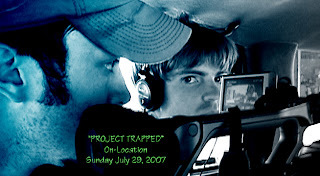 "Project Trapped" is still going strong in its third straight weekend of shooting. This past weekend we were on the streets of Metamora near Pine Street (My old neighborhood), and at an apartment in the town square. Saturday was pretty laid back and we finished up early. Sunday was a long day but we started strong and ended strong. Production is going well. (Above is a picture of Me (Left) and the Producer Levi Steven Obery (Right)) We had extra help today from Nicky Gorman, who came from out of town to assist us. We plan to return to Washburn next weekend to shoot the final climactic moments of the film.